It has been a while since I have had a few minutes of peace to post. So this is a catch-up one with lots of pictures. 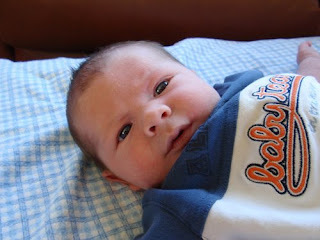 Here is our little Jackson at 9 days old (11/18). He is showing his Popeye face. It’s the look he gets when he gets ready to eat. Nicholas has heard me call him Popeye and now says Popeye and baby. 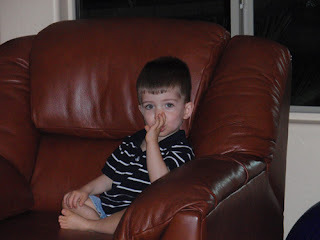 When did my little Nicholas learn how to crawl up into the big chair? He is watching his favorite show on Baby TV (11/19). 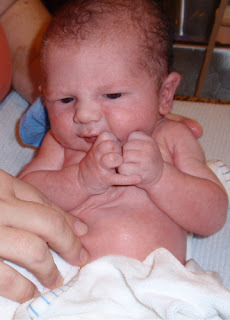 Jackson getting his 2nd bath at home. No pictures of the first one, as Mike was in the other room bathing Nicholas that night. Oh well I guess I am a bad scrapbook mommy (11/21). 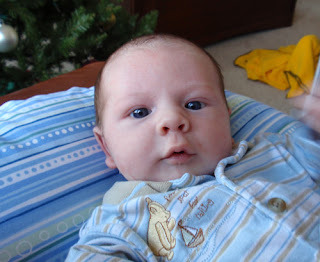 Jackson at almost 2 weeks old (11/23). Time is flying by. In December I wanted to do the Daily December Journal’s that many others are working on, but it just isn’t in the cards. I didn’t have time to get it together before Jackson came. So I decided to try to at least snap a few pictures most days, so I can do a few layouts later in the month of our December this year. 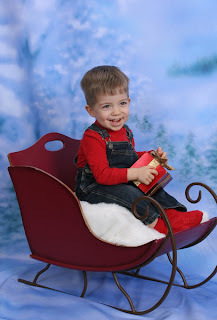 12/1 – I was checking e-mail when I heard Nicholas laughing hysterically in the kitchen and I could hear the pitter patter of his feet running around. I walked in to see him chasing the puppies around the island and he was having the best time. I had to stay and watch he was having so much fun and his laughter is just so contagious. 12/2 – I stole a couple hours away from home for the first time to get a mani/pedi. I came home to Mike and Jackson kicking back on the couch enjoying some “male bonding” while Nicholas was napping. 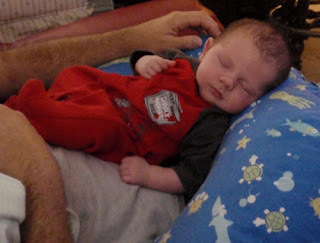 Jackson looked pretty content just resting in daddy’s lap. We brought the bouncer back out for Jackson, but Nicholas has decided it is a lot more fun for him to sit in and “bounce, bounce, bounce” (12/3). 12/5 – We got some shopping done today at the mall and had lunch at the Cheesecake Factory. Nicholas was goofing off with his daddy. I can’t believe they don’t have a kid’s menu. The chicken strips and fries they called “kid friendly” that they brought Nicholas were huge, an adult couldn’t have eaten all of it, not to mention it was $8, (ouch) and didn’t include a drink which was another couple of dollars. 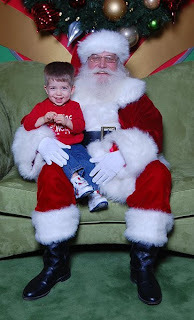 Nicholas also got to see Santa today. He did good with him again this year. We weren’t sure if he would be afraid of him or not. He did fine when we saw characters at Disneyland this year, but that was back in April. But he just sat in his lap and checked him out and smiled for the camera. It was a great time to see him, there was only one person ahead of us so we weren’t rushed. Jackson was sleeping though, so we skipped it this year for him. 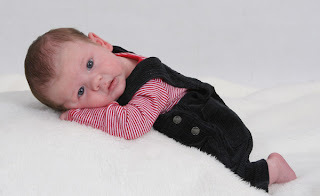 12/8 Jackson and I were just hanging out and he was so alert I had Mike get me the camera and I got this shot of my growing little guy! He is starting to be a little more alert and not sleeping all the time. 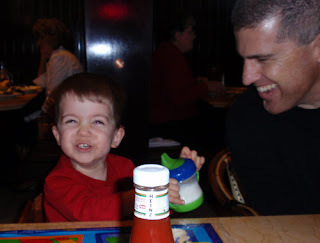 12/9 We hit Toys R Us today and had lunch at Red Robin before hitting the mall for a little more shopping. 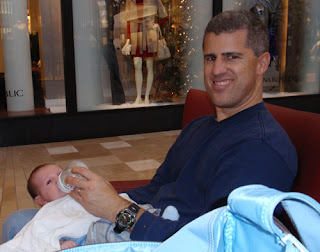 Mike fed Jackson a bottle so Nicholas and I could go get a few presents purchased. Nicholas and Jackson got their first Build-A-Bear’s built from Santa. Buddy and Peanut will be arriving Christmas morning from Santa. 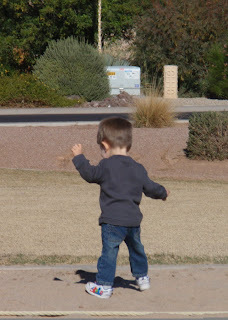 12/10 We headed to the park this morning to meet Nicholas’ occupational therapist, Tracy. While we were waiting Nicholas explored the park. 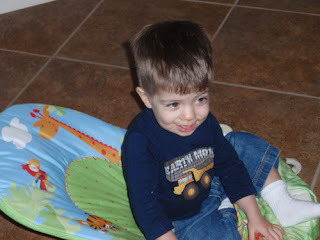 While we were settling Jackson in the stroller Nicholas had took off to explore. Mike had to run and catch him. Both Nicholas and Mike were worn out after all the walking, climbing, sliding and swinging at the park that morning. I got a little alone time that afternoon which I spent Christmas shopping. 12/11 We went to the pediatrician for Jackson’s one month appointment this morning, and that little guy is now just under 10 pounds and is 22 inches. He has gained 2 lbs. 10 oz. since he came home from the hospital. He wants to eat all the time. I guess I don’t need to worry if he is getting enough to eat at all of those feedings. LOL! 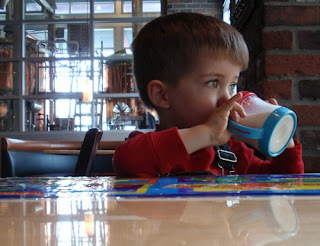 12/12 After spending the morning getting pictures taken at Kiddie Kandids we stopped for lunch at BJ’s. Nicholas is so good when we go out (as long as we have a little snack for him while he waits for his food). He likes to sit next to his daddy and eat his big boy lunch. And here are our pictures from the Kiddie Kandid’s photo shoot. We had a small wardrobe malfunction that morning. 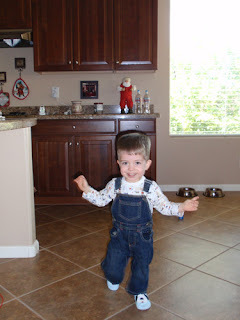 Nicholas and Jackson had matching overall’s, but when we put Nicholas in his they were about 4 inches above his ankle. So we improvised with other overall’s and we were all set. 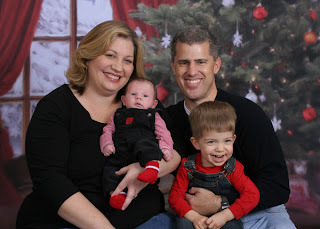 Our first family of 4 picture. We got lucky this came out since Nicholas was about done with pictures by this time. We even got one with Jackson awake and looking at the camera! 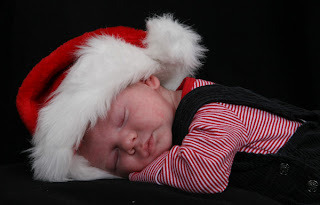 Our little Santa Baby! Jackson did really good for his pictures. Although he didn’t get the memo that he is too little to be trying roll or crawl away just yet. We are going to have to keep a close eye on this one. 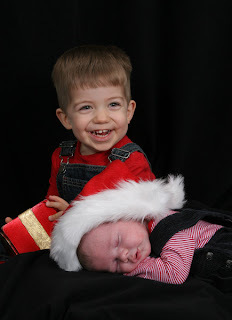 The photographer was great with both boys. And we got really lucky that when Jackson did wake up he was alert and happy, even if he was turning his head away from the camera at times. 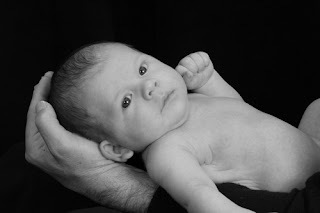 This is the picture we are using for his birth announcements. Which now will be going out soon now that I decided to not make them myself. Despite his happy face, Nicholas wasn’t too thrilled about taking this picture. We think he is a little nervous around the baby, unless we are holding him. So we were happy to get this shot of the two of them. 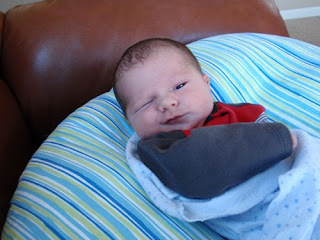 And here is my little ham, Nicholas. He always does really well for the photographers there. Now for me he won’t even look at the camera anymore. 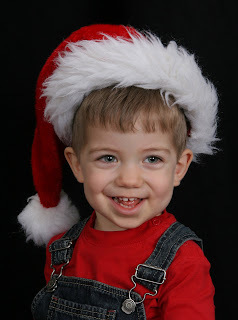 And my big Santa Baby! If you are still reading, sorry for the long post. Maybe now that things are calming down a little bit, I can be a little more regular about posting. Michelle, you have such a beautiful family!!! All those little baby pics are just soooo precious. 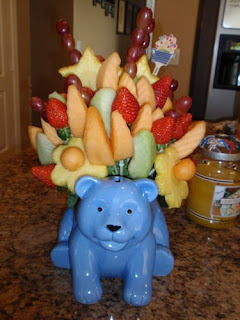 And your big boy too, so cute!!! Thanks for sharing all the pics, hope you and your family have a wonderful holiday!